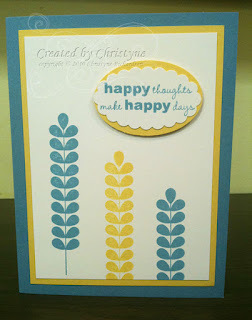 Oh love the different heights of that plant stamp! And love the idea of the 29 gifts! Wil have to consciously do it! This is a very pretty card, I hope today was a better day for you. ohhhhhh, ahhhhhhh, gorjus!!!! I didn't get this set as I know I'll earn it but the wait is killin me!!! Great color combo too! I like these colours together too. Looking forward to using the new colours more and more! great concept...can i have killing the kitchen man as one of my give aways?